Leave a comment on THIS post by 6 p.m. CT Tuesday, August 25, 2015 to be entered in the DRAWING for an eBook copy of the book below. If you mention in your comment that you’re a follower (see in the left sidebar “Join This Site” and “Follow by Email”), I'll add your name a second time in the drawing. U.S. mailing address required to receive a paper book. Read book giveaway details at Disclaimers. To provide you security, please leave your email address like this: johnATyahooDOTcom. Winner announced in next Thursday's blog post. Welcome, Valerie. If you could have dinner with one person from today or history (except Jesus) who would it be? I don't really have historical heroes who stand out that way. My favorite dinnertimes are when my entire family surrounds me: my husband, our kids, their spouses, and the three grandgirls. What a blessing! I love the process of seeing where God and the characters will take each story. I don't plot much in advance, so I get some big surprises during the writing process. I ask God to make His message shine through the conduit of my writing. It gets a bit scary at times, but the exhilaration makes it worthwhile! My September release is the fourth in my Riverbend Romance Novella series, a fun story called Team Bride. I don't have the official blurb yet, but Corbin and Sarah meet when they are best man and maid-of-honor at their best friends' wedding. He's a bit of a prankster, and she… well, let's just say she is not amused. Let their friends know they loved it! Whether it's by writing a review, putting it on lists at Goodreads, raving on Facebook — or other ways. Plus, I have a Street Team on Facebook for those who are eager to help spread the word. Please tell us a little about your novel, Plum Upside Down. Green Acres newcomer Chelsea Riehl is annoyed. After all, she signed on as an event planner, not to pit plums alongside mission-minded hippie Keanan Welsh, the only other single on the farm. Discouraged by Chelsea’s lack of spiritual depth, Keanan is confused when she offers to arrange meals for the church Alpha program he is co-hosting. Maybe he misjudged her, after all. When fake it ’til you make it gives way to a leap of faith, both Chelsea and Keanan have some soul-searching to do. Will getting on the same page spiritually be enough to flip their budding romance right-side up? I want Christian women to realize anew the depth of love that God has for them as individuals, not just as one of a large group of believers. 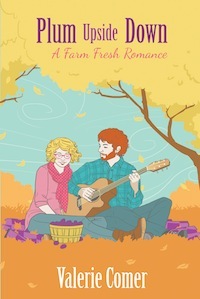 Come over to http://valeriecomer.com where you can find my blog, social media links, and a signup to my email list — a free Farm Fresh Romance short story is available to subscribers. Where can readers purchase Plum Upside Down? While Plum Upside Down is the fifth book in my Farm Fresh Romance series, it can be read as a standalone. However, the first book in the series, Raspberries and Vinegar, is available as a free e-book on Kindle, Nook, Kobo, and iBooks, so you can easily see if you'd like to invest yourself into the entire series! One more book, Berry on Top, will complete the set in early 2016. Have you ever struggled to believe God loves you personally and passionately? Thanks, Valerie, for visiting with my readers and me. One of the commenters will win an eBook copy of Plum Upside Down, which you’ve graciously offered. Caryl Kane, please remember to leave your email address so I can enter you in the book drawing. The winner of last Tuesday's blog post for a copy of The Extraordinary Presence of God by Ann Knowles is Connie. I’ll email you. 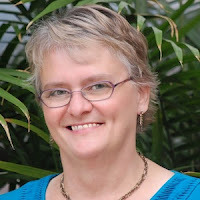 The winner of last Thursday’s blog post for a copy of Catching Up with Daylight by Gail Kittleson is Patricia. I’ll email you. Thanks all for commenting. Watch for more book giveaways. Enjoyed the interview. I have read and loved all of Valerie's books and loved Plum Upside Down. Please do not include me in the drawing as I have read the book and would love for someone else to be blessed with a copy. Ann, glad you enjoyed the interview with Valerie. Thanks for leaving your comment. I hope you're blessed by Plum Upside Down! Yes, I have struggled with my self concept and have often felt that Of couldn't live me. I was so horrible to my children after my husband died and I felt so unbelievable. But I have come to know that I am precious in the Lord's eyes and He loves me very much just the way I am. I'm so sorry to hear of the difficult way you've come to know God's love, but so thankful you have! Blessings. Yes I have struggled to think God loves me personally. I am an avid reader of Valerie Comer's books and love every one. Thanks, Linda. Such a common struggle, I'm finding out! Linda, thanks for leaving your comment. I USED to struggle with this, but not any more! Just like with my kids (and now granddaughter), I love them just because they belong to me.I think having my granddaughter has taught me that lesson in a more personal way. She'll never lose my love nor will it ever diminish :-) I'd like to think that's how God loves us too, don't you? Yes, the grandgirls helped teach me about God's love, too. FOR SURE! It's relationship based, not merit based! Trixi, glad you came by and left your comment. Thanks for following my blog! Depression is a mean and nasty thing and, yes, can make it very difficult to embrace God's full, personal love. You said that so clearly. Hugs. Debbie, thanks for reading and commenting. Zeph. 3:17 has always warmed my heart, Valerie. Good to hear it in an unfamiliar version - and love your title! Gail, thanks for coming by and leaving your comment. Sarah, thanks for stopping by and leaving your comment.